He‘s perhaps best known for playing opposite Jim Carrey in Dumb and Dumber, and has scored major credits in recently released major motion pictures—playing Apple CEO John Sculley in Steve Jobs, and a NASA honcho in Ridley Scott’s blockbuster The Martian. 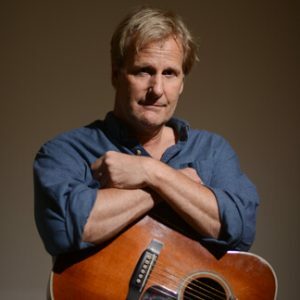 It may seem odd then that a star of Jeff Daniels’ rank places his career playing music on par with acting. But he does. And while Dumb and Dumber revealed his considerable comedic talent, Daniels is rather serious about his other career—he sees music as no laughing matter. At least, not totally. And if art is the process of constant testing to see whether an artist is performing genuinely, or as a phony—Daniels’ sincerity passes that test. He respects the craft of storytelling, adores acoustic guitars (has an eponymous signature edition), and has been experimenting with harmony since the days he anxiously awaited the results of audition calls in New York City. Music, then, for Daniels, has been a passion since the early days of his career. Is he though, an actor who makes music, or a musician who acts? Daniels concedes that an actor with a guitar is a tough sell, that it generally doesn’t work. A theater and drama major in college in his home state of Michigan, he eventually gravitated to New York in 1976, where he acted on and off Broadway. He arrived with a Guild D-40 from Herb David’s Guitar Studio in Ann Arbor, and an old Buick. 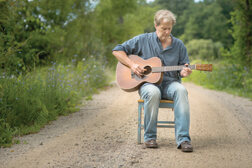 After 25 years as a closet singer, songwriter, guitarist, in 2001 Daniels took to the stage for the first time as a musician to play a fundraiser for the Purple Rose Theatre Company, a non-profit he founded in Michigan in the early 1990s. “I remember seeing my first concert at the Bottom Line in New York,” said Daniels, the son of a small-town lumber company owner (and mayor). “I saw Arlo Guthrie. And at the time, there were a lot of musicians who were into storytelling, like Arlo Guthrie, and who were very funny. Back then, it was okay for musicians to entertain and be funny. You could do a funny setup for the serious songs. I’ve always wanted to do the same sort of thing, to be someone that did both. That has always appealed to me, a musician with just a guitar, just your songs, and entertaining”. At one point, Daniels told us, his guitar became his best friend. In 2001, he started playing a 1934 Martin C-2, the broken archtop of which had been replaced with a soundboard of Adirondack spruce, in effect converting it to an Orchestra Model. Since then he has released six CDs, recorded approximately 80 original songs, and has been on the road with his son, Ben, traveling and playing hard. Perhaps most importantly, every step of the journey he has been receptive to learning. If criteria exist for the genuineness of an artist’s work, calculation and affectation would probably not make the list—while Daniels’ guitar picking and conversational storytelling are natural and spontaneous. His songs can be touching, funny, or just plain screwball. It’s evident Daniels has plenty to express, an abundance of feelings to convey. Speaking about songwriters he admires, Daniels revealed what he himself goes through trying to write a good song. Adjusting to the lifestyle, the ups and downs, and the schedule of a musician hasn’t been too hard of an adaptation for Daniels and his son with whom he merges and rotates sets while on the road. Comparing his work as an actor, to that of a musician, Daniels said music provides him with a distinct sense of freedom and self-regulation that sets the medium apart from the movie industry. Daniels sees art, music, acting, though, all coming from the same source. “If you are a creative person, you have to create,” he said, yet his approach to music is distinctive, fundamentally uncalculated, almost Zen-like—achieving without trying to achieve. Recognizing the fickle nature of the movie business, Daniels told us that it is the creative process that keeps him going, and that is its own reward. While speaking affectionately about guitars and music, and of his respect for the technique of great songwriters, Daniels expressed no delusions of grandeur as he explained what he can and can’t deliver. 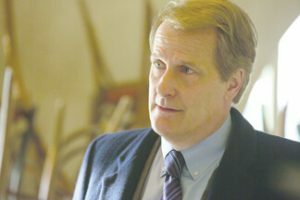 Jeff Daniels as Apple’s John Sculley in Steve Jobs. Daniels speaks of creativity, imagination, and full presence as the true order of things while on stage. If awkwardness in art is a kind of hesitation born of self-doubt, the artist must get rid of that hesitation, especially in the performing arts. Daniels revealed that he still shakes off such sentiments. That may sound strange considering he has appeared in three films nominated for Oscars (all for Best Picture): Terms of Endearment (1983), The Hours (2002) and Good Night, and Good Luck (2005), and then in a just released, major motion picture about the iconic Steve Jobs. With his refusal to be type cast, though, or to rest on his laurels, while at the same time throwing himself before a live audience night after night, self-doubt still goes with the territory.